Indiana State University student Yi-Fan Wang initially feared that his English classes at Interlink would feature students simply sitting at their desks, repeating the alphabet by rote. Yet as one of his classes watched footage of the final space shuttle launch in July 2011 before the instructor asked for students' thoughts, Wang learned just how reality was much different from what he expected. Each year, hundreds of international students from around the world study in English classes at the Interlink Language Center housed at Indiana State. The center prepares students not only in linguistics, but in many different aspects of life they will encounter while in the U.S.
"Almost every single activity is very interesting, and very close to real life," said Wang, who is from Taiwan and pursuing his master's degree in early childhood education. "Sometimes we'll talk about food, movies or games, and also holidays." Interlink provides English as a Second Language (ESL) instruction at centers that are located on college campuses across the country. Yet the center also provides cultural orientation, and supports international students as they adjust to life in Terre Haute, said Allyson Newport, interim director of the Interlink Language Center at Indiana State. "We do a lot of academic skill preparation because we are trying to prepare them for ISU, so it's not just learning English," Newport said. "It's also learning skills to help them cope when they do enter the university." The language center also takes advantage of its location. Instructors will sometimes assign projects that require the international students to speak with Indiana State students. One assignment that Naif Masrahi completed required him to ask domestic students about the meaning of five English words. "When you ask an American, they will give you different meanings," said Masrahi, an Indiana State student from Saudi Arabia pursuing his master's degree in linguistics. "That will help you to understand the vocabulary, which should be used in your writing and speaking also." The Interlink assignments help the students learn how to navigate Indiana State. For another project, Wang had to log into the website portal known as MyISU. He had to research information about his major, sit in on two classes he would be required to take at ISU and take notes. "The biggest step for me is now I know how to take notes in English, and this skill is very cool and very useful, because it's good" to use in many ways, Wang said. Interlink features courses at different levels based on the student's ability to speak and write English. The assignments increase in difficulty as students advance in their coursework, which culminates in writing a 10-page academic research paper. "It improved my academic writing skills," said Masrahi, who worked as a journalist and studied in Britain before coming to the U.S. "I used to have the normal English, which is writing for newspapers, which is different from writing for academic research papers, either MLA (Modern Language Association) or APA (American Psychological Association) style." While international students are enrolled at Interlink, they also have access to many of the on-campus facilities that Indiana State students do, such as the Student Recreation Center and Cunningham Memorial Library, Newport said. "They become part of the ISU community even before they officially enroll at ISU, which is a huge advantage because then they are accustomed and they don't have to make that adjustment when they enroll, as well as figure out classes," she added. "It helps a lot." Interlink provides an advantage for Indiana State to reach out to potential students around the world, said Chris McGrew, director of International Programs and Services at ISU. International students may have the academic qualifications to study in the United States, but do not score high enough on English language testing, which students can then resolve by taking classes at Interlink. "It's a really nice thing for us because there are particular regions of the world where students have trouble with the English language skills in order to come here," McGrew said. "At Interlink, they come to campus, they're taking courses in ISU buildings, they're staying in ISU residence halls, and they're interacting with faculty here, so there's a nice integration." At Interlink's most recent graduation ceremony for students in December, teachers and students talked about the graduating students, which included memories they made while living in Terre Haute. 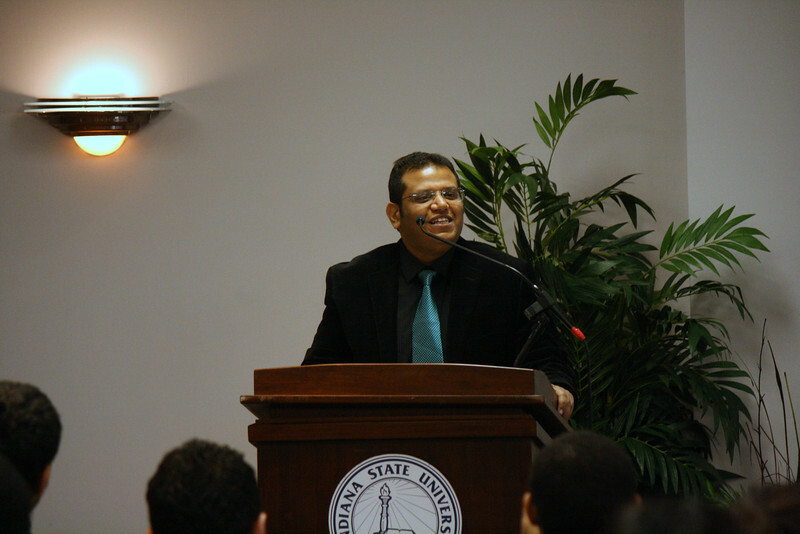 McGrew talked about what the students matriculating to Indiana State can expect and congratulated the new Interlink grads, including Masrahi, who is a member of the academic staff at the English Language Center of Jazan University in Saudi Arabia. "I learned so much about the American culture, as well as the academic background, along with listening skills, speaking skills," Masrahi said of his time at Interlink. "I think it was a good experience for me." Many students that attending the language center have been referred by friends or family members who had positive experiences in the program, Newport said. Even Wang, who at first was hesitant about English classes in the U.S., is now trying to encourage some of his siblings to study in the U.S.
"Interlink is very cool," he said, adding that international students "don't like to learn English in an academic way." "But," he added, "Interlink provides us a very different option." Photo: http://isuphoto.smugmug.com/photos/i-TQMXXHL/0/L/i-TQMXXHL-L.jpg Submitted photo)Several students from the Interlink Language Center housed on the campus of Indiana State University pose during a graduation ceremony. Photo: http://isuphoto.smugmug.com/photos/i-VT2Xdvq/0/L/i-VT2Xdvq-L.jpg (Submitted photo)Naif Masrahi, who graduated from Interlink Language Center in December before enrolling at Indiana State University. Each year, hundreds of international students from around the world study in English classes at the Interlink Language Center housed at ISU. The The center also prepares students for many different aspects of life they will encounter in the U.S.